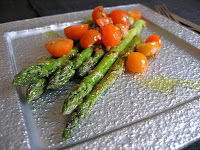 This recipe is among the favourites in my kitchen during the asparagus season. It is extremely simple and in its simplicity amazingly tasty. 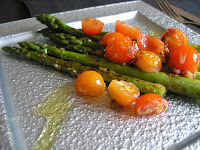 The asparagus and tomato get only very brief treatment and stay crunchy and fresh. I like a little sweet-sour taste with the more neutral asparagus. For a light main meal just double the quantity. 12-14 cherry tomatoes, halved or cut in quarters. Prepare the asparagus by rinsing the spears in cold water, cutting or breaking off the tough ends (ca 2cm at the bottom). 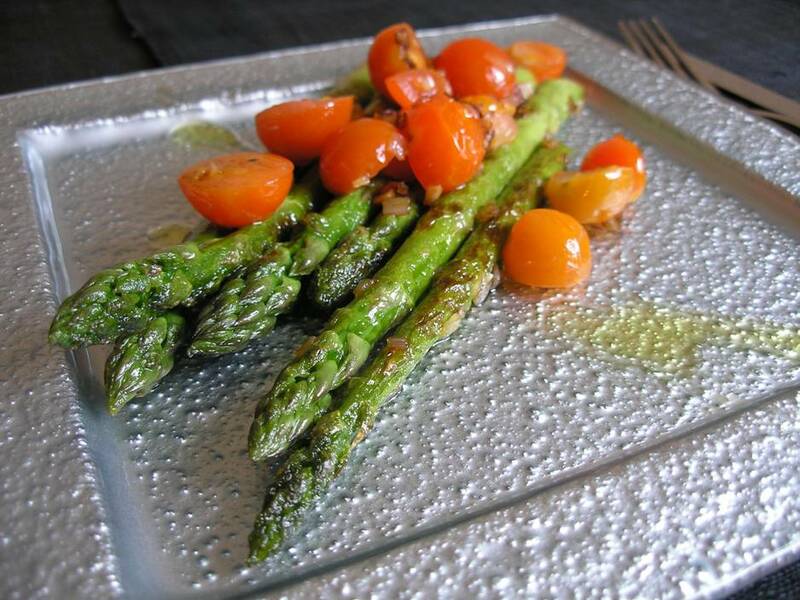 Dry the asparagus in a kitchen paper or towel. Take a small pan and heat 2 table spoons of oil, add the finely sliced onion. When the onion is starting to turn slightly glassy add the chopped garlic and cook for 2 minutes. Add sugar and some salt and pepper to the onion-garlic mix, stir and cook for another minute till the onions and garlic are soft. Take off the heat. Add the vinegar and mix. Cut the tomatoes depending on their size into 2 or into 4. Mix tomato with the onion and garlic mix but don´t cook. Take a grill pan and heat 2 table spoons of oil. Add the asparagus and cook the spears for about 3-4 minutes, when they start taking brownish colour on one side turn the sides and briefly fry on the other side too till it starts to take some colour for another 3 minutes. Taste to ensure that the thicker end is cooked but still crunchy. Don´t add salt when cooking the asparagus. Serve straight away. Tastes good also luke warm. Serve with some fresh bread to help soak up the tomato sauce. Is food turning into soap? Lime or Lemon - what´s the difference?